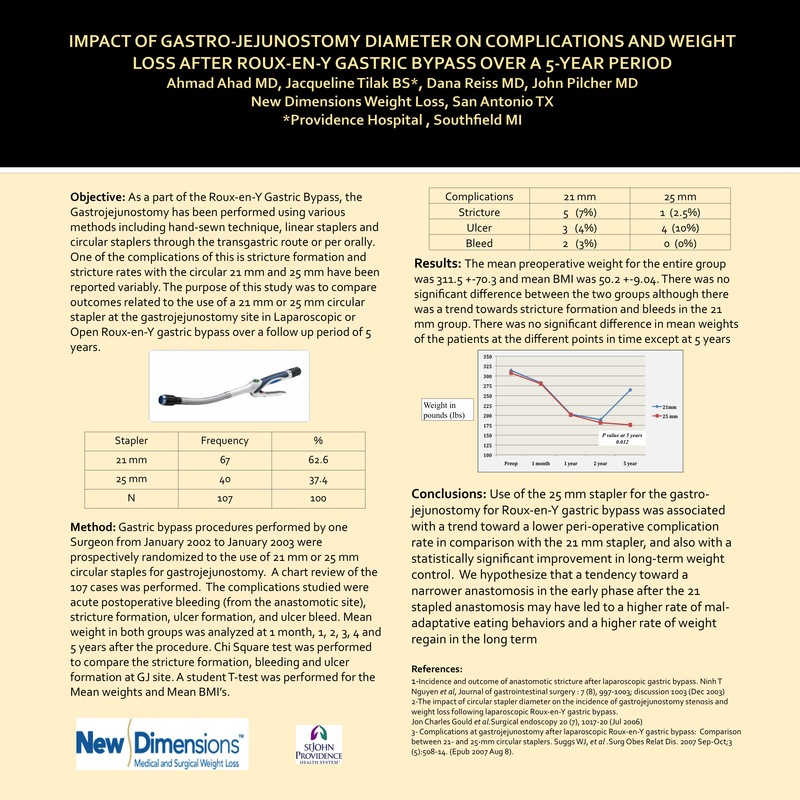 Objective: The purpose of this study was to compare outcomes related to the use of a 21 mm or 25 mm circular stapler at the gastrojejunostomy site in Laparoscopic or Open Roux-en-Y gastric bypass over a follow up period of 5 years. Methods: Gastric bypass procedures performed by one surgeon from January 2002 to January 2003 were prospectively randomized to the use of 21 mm or 25 mm circular staples for gastrojejunostomy. A chart review of the 107 cases was performed. The complications studied were acute postoperative bleeding (from the anastomotic site), stricture formation, ulcer formation, and ulcer bleed. Mean weight loss in both groups was analyzed at 1 month, 1, 2, 3, 4 and 5 years after the procedure. Results: The gastrojejunostomy was performed with 21 mm stapler in 63%(n 67) and with the 25 mm stapler in 36% (n 40) patients. There was no significant difference in complications between the two although there was a trend towards greater stricture formation and ulcer bleeds in the 21 mm group. There was no significant difference in mean weights of the patients at the different time points except at 5 years where there was a statistically significant difference in mean weight between the two groups (p= 0.012) with a lower mean weight recorded in the 25 mm stapler group. Conclusion: Use of the 25 mm stapler for the gastro-jejunostomy for Roux-en-Y gastric bypass was associated with a trend toward a lower peri-operative complication rate in comparison with the 21 mm stapler, and also with a statistically significant improvement in long-term weight control. We hypothesize that a tendency toward a narrower anastomosis in the early phase after the 21 stapled anastomosis may have led to a higher rate of maladaptive eating behaviors and a higher rate of weight regain in the long term.